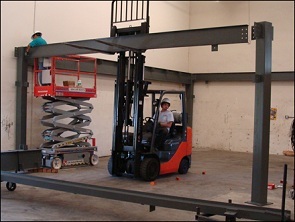 LSM Installations provides experienced, reliable, and most of all, courteous installers to perform assembly and finish-out services for your mezzanine, lifts, rack and shelving system project. Our team of professional installers are fully insured, licensed forklift operators, factory trained on assembly procedures, and comply with all facility-required safety training as well as our company's safety courses. Whether your project is large or small, you can trust LSM Installations to efficiently handle your equipment installation needs fast and safely without disrupting production at your facility.